Even though there’s a major international shipping channel cutting through the center of town, the pace in Chesapeake City is easy-does-it. With roots dating back to the 17th century, not only does this picturesque hamlet on Maryland’s Upper Eastern Shore charm visitors with welcoming inns and B&Bs, out-of-the-ordinary shops, and a remarkable number of recommendable restaurants, but separated into northern and southern districts by the Chesapeake and Delaware Canal, Chesapeake City also offers exceptional inland vantage points to observe mega-yachts and massive ocean-faring commercial vessels from around the world. The original, hand-dredged C&D Canal was completed in 1829. In 1839, reflecting the ambitions of the rough and rowdy boomtown it had grown into, Bohemia’s name was changed to Chesapeake City. Not quite a century later, the canal was modernized, eliminating any need ships had to make port there, and a decades-long economic downturn began. The seeds of recovery were planted in the 1970s and ‘80s, when a group of concerned citizens made an all-out effort to bring life back to their once-active maritime village, and now, the renaissance is in bloom. Convenient to the region’s major metropolitan areas, today’s Chesapeake City feels a world apart. It’s a perfect spot to spend a couple of laid-back days. Lunchtime is a good time to start a Chesapeake City visit. In 1974, the town’s Victorian-era southern district was placed on the National Register of Historic Places, and The Bayard House, (410-885-5040, bayardhouse.com) c.1780s, located waterside at 11 Bohemia Ave., is said to be Chesapeake City’s oldest existing building. The Hole in the Wall, the Bayard House’s downstairs bar, and the Canal’s Edge Umbrella Bar give diners indoor and outdoor seating options to take advantage of the best views of the canal. Both spaces are casual and serve from the upstairs dining room’s full menu. Appetizers run the gamut from a gnocchi-Tasso mac-and-cheese to shaved octopus, and popular sandwiches include a classic Maryland crab cake. Rockfish BLT tacos are another good choice. Because relaxation is the objective here, a cold regional brew or one of the Bayard House’s signature cocktails might also be of interest. A midday alternative, particularly if it’s before noon and you’re craving breakfast, is the Bohemia Café & Bakery (401 2nd St., 410-885-3066), a crowd-pleasing spot for residents and tourists alike. The neighborly atmosphere is a draw, as are the fresh baked goods (strudel!) and such favorites as creamed chip beef, cinnamon bun French toast, and pork schnitzel sandwiches with Austrian potato salad. Afternoon sightseeing should involve some quality time at the Chesapeake and Delaware Canal Museum (chesapeakecity.com/cd-canal-museum). Owned and operated by the Army Corp of Engineers, the 14-mile C&D Canal connects the northern Chesapeake Bay with the Delaware River. Tens of thousands of watercraft utilize the passage every year, including almost half of all commercial shipping traffic in and out of the Port of Baltimore. 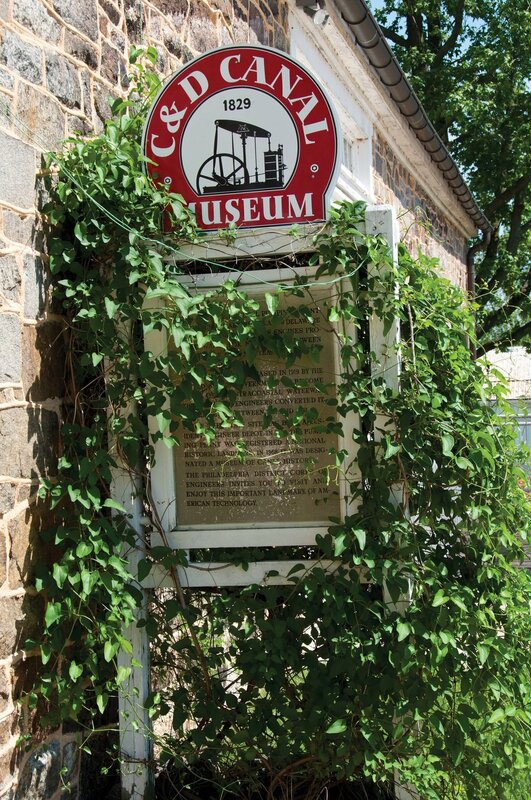 The self-guided museum inside the canal’s original pumphouse showcases the C&D’s history and operations through traditional displays, multimedia, and hands-on exhibits. The contrast represented between the huge antique waterwheel and steam engines from the canal’s long-gone early days and the modern fiber optics and microwave systems which now allow all canal activity to be viewed through a TV monitor provides perspective into the scope of technological advancements through the years. Outside, there’s a modest park setting next to the C&D, and a full-sized replica of the Bethel Bridge Lighthouse, which used to inform ship captains of the operational status of the old canal’s locks and drawbridges. If being near the water is good for the soul, being on the water is even better. Daily canal tours, happy hour cruises, and sunset cruises are available through MV Bay Breeze Boat Cruises (410-885-5500, mvbaybreeze.com), embarking from Schaefer’s Canal House, and Chesapeake City Ferry and Water Tours (443-566-3386, chesapeakecitywatertours.com), ported at the historic district’s public dock. For extra fun times, both vessels can be reserved for special celebrations with friends and family, corporate outings, crab feasts, and booze cruises. Lodging is limited in Chesapeake City. It’s a small town, and rooms tend to book early, so make reservations as far in advance as possible. When it’s time for you to check in, it’s time to return to the historic district. The elegant yet cozy Inn at the Canal Bed & Breakfast (410-885-5995, innatthecanal.com) at 104 Bohemia Ave., the largest of three 19th century homes within a block of one another that have been converted into inns, was built by a prominent businessman in 1876 to commemorate the birth of his son. Well-appointed and immaculately preserved, the Inn at the Canal is full of intriguing history, stately architectural details, and an inviting spirit. Cordial hosts put out a hearty breakfast. Doc Smithers B&B (410-885-3820, 204 Bohemia Ave.) is just down the street. With a reputation for old fashioned hospitality, tea is served every afternoon, and each evening the proprietors host an ice cream social. Fans of The Blue Max Inn (410-885-2781, bluemaxinn.com), c.1854, recommend “the house with the generous porches,” at 300 Bohemia for its comfortable accommodations, appetizing breakfast choices, and luxurious attention to detail. For the ultimate in romantic pampering, try the honeymoon suite’s plush king canopy bed, private balcony, fireplace, and whirlpool tub for two. For fun-filled adventures of a less amorous kind, see the Blue Max’s website for info on their Murder Mystery Weekends. The highly rated Ship Watch Inn (401 1st St., 410-885-5300, shipwatchinn.com) is the sole B&B in Chesapeake City on the canal. Guests here can unwind on the outdoor decks with no other intention than taking in the scenery and keeping an eye out for the occasional ocean liner or cargo ship passing. The most unique place to stay is the Old Wharf Cottage (410-885-5040) located along the water’s edge at the foot of Bohemia Avenue. This perfect, little, private escape has a sitting room, kitchen, and bath on the cottage’s first floor, and an upstairs bedroom that boasts a singular up-close and panoramic canal view. Traditional dinner and entertainment options in Chesapeake City focus on Schaefer’s Canal House Restaurant & Bar (410-885-7200, schaeferscanalhouse.com) and Chesapeake Inn (410-885-2040, chesapeakeinn.com). Schaefer’s has been a boaters’ north-shore favorite since 1935. Chesapeake Inn is a well-known mainstay on the south side harbor. Both landmark restaurants offer service in their respective water-view dining rooms, as well as at their casual dock bars, which feature specialty menu items, frozen drinks, and live entertainment. If there’s gas left in the tank, how about a nightcap at the Tap Room Crab House, (210 Bohemia Ave., 410-885-2344, taproomcrabhouse.com), the neighborhood hotspot, if what you’ve really been hankering for is comfort food and steamed crabs. Exercise can be relaxing. After all of yesterday’s indulging, not to mention today’s late start and generous breakfast at your B&B, it’s time to hit the Ben Cardin Recreational Trail. 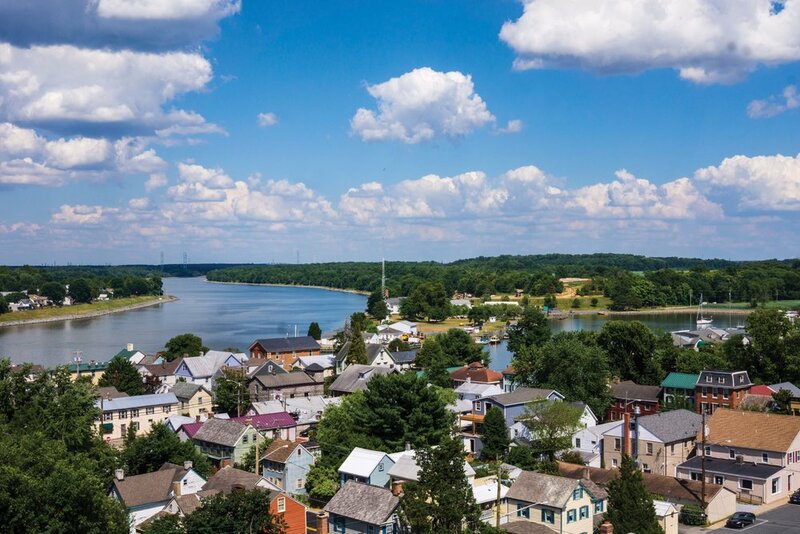 Named for Maryland’s U.S. senator who supported its creation, the 1.8-mile trail on the canal’s northern bank is friendly to walkers, runners and bicyclists, and links to Delaware’s Michael Castle Trail for a total distance of 17 miles. The Chesapeake City trailhead begins at the ferry dock on Lock Street, near Schaefer’s. The trail is mostly flat and sticks mostly to the canal, but there is a small climb where the path traverses through a wooded patch for a stretch. Be mindful of the sun and don’t forget to stay hydrated. After a rest, perhaps a massage pre-scheduled through an innkeeper followed by some shopping in the eclectic stores on Bohemia Avenue will be part of your leisurely itinerary. A diverse array of nautical and country-themed home furnishings, Christmas ornaments, gourmet food, and more can be found at The Old Gray Mare Gift Shoppe. Chick’s, a trendy boutique, features jewelry, clothing and accessories. Evy & Ro, “where boho meets chic,” specializes in gifts, jewelry, and wedding rentals. Besides a vast selection of their namesake wares, My Jewelry Place sells extraordinary gifts and décor. Belle Connell’s Emporium has two floors full of such “Niceties, Necessities & Needful Things” as collectibles, clothing, jewelry, and toys, plus personal and travel necessities, which are otherwise hard to come by in the historic district. In the back of this fascinating shop is a Northeast Chocolates candy counter displaying rows and rows of handmade fudge, brittles, and confections, and delicacies like Fisher’s Popcorn. Even sugar-free items and doggie treats are available, while the true sweet-tooth connoisseur will be enticed by the shelves of vintage goodies such as old-fashioned rock candy, wax bottles filled with colorful liquid, and candy cigarettes. One-of-a-kind treasures handcrafted by local artisans can be purchased at the Silver Saltbox, the tiny shop adjacent to the Inn at the Canal. Originally built because homeowners within city limits were not permitted to operate businesses out of their residences, the 10- by-10 foot auxiliary structure at 104½ Bohemia Avenue is the last of its kind remaining in Chesapeake City. Having served many uses over the years, the pint-sized building was even utilized as a jail fora time. Antiquers will love the furniture, stoneware, decoys, oyster tins, and country store memorabilia at Black Swan Antiques. Classic and newfangled playthings are for sale at Toy’s from the Attic & More, and Canal Lock Antiques not only markets antiques and curios, but also conducts walking tours spotlighting area history. It’s dinnertime, and after all the partying the evening before, it’s time for a more intimate and softly lit dining experience. Prime 225 (410-885-7009, prime225.com), at 225 Bohemia Ave., is a high-end restaurant designed to combine top-notch food and drink with upscale ambiance and service in an unexpected location. Though the menu changes regularly to accommodate the freshest ingredients and the chef’s endless creativity, Prime 225 always features the finest cuts of meat and a variety of seafood choices, including a popular sea bass cioppino in a lemon-saffron broth. Culinary inventiveness extends into the sharable starters, à la carte sides, and desserts, and there are world-class wine, beer, and cocktail lists to choose from. An ever-evolving infusion jar tempts with whatever current elixir is being dispensed. Afterwards, you should call it a night. Maybe a quiet walk down to the docks, or a sleepy respite on a balcony overlooking the C&D and the serene village below, but little else should be planned. It’s late. Chesapeake City is tranquil. You’re carefree. And life doesn’t get much better than that. Brent Lewis, who lives on Maryland’s Eastern Shore, has written two nonfiction books on the history of Kent Island and the down and dirty crime novel, Bloody Point 1976. He blogs regularly at easternshorebrent.com.